Lack Table goes Modern Moroccan! 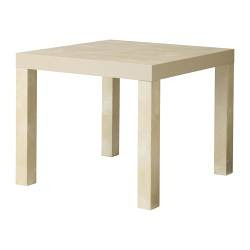 Add shape and color to a plain Ikea Lack end table with a simple technique for gluing paper right on to your surface. 1. You can use any type of shape to decorate your table – circles, triangles, flower shapes, etc. We used a rounded diamond shape. To make a template for this shape, use a yardstick to draw a straight line across the length of the large piece of cardstock or poster board, and draw another line across the width of the paper that intersects with the first line, so that your paper is divided into four sections. Use the large bowl to draw an arc in each section of the paper. Cut your diamond out and trim about 1/8 to 1/4 inches off of each point to create blunt edges. This will make it easier to use the template. 2. Using your template, trace several shapes onto the paper you have chosen for the table and cut them out. The size of your table will determine the number of cutouts you need. 3. Sand the top of the table with fine grit sandpaper. Wipe away the dust with a clean towel or rag. 4. 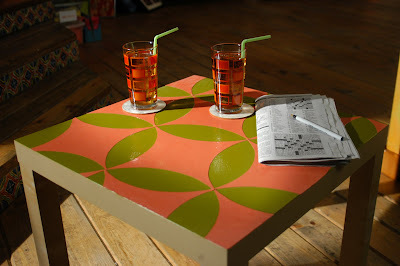 Use painters’ tape to tape off the vertical edges of the table. Apply one to two coats of primer to the top of the table with a paint roller, allowing it to dry in between coats. After primer has dried, apply one to two coats of latex paint to the tabletop, allowing it to dry in between coats. Allow to dry completely before moving on to step 4. 5. With a large foam brush, brush over the back of each shape with decoupage medium and place them down on the table, corner to corner. Smooth out air bubbles as you go along. Brush decoupage medium on the entire tabletop. Allow to dry and apply a second coat. Trim away any shapes hanging over the edges. 6. Once the second coat of decoupage medium is completely dry, brush on a coat of glossy polyurethane on the tabletop, using the foam brush. Allow to dry. Apply a second coat. 7. Allow the second coat of polyurethane to dry for 2-4 hours before removing the blue tape. You may need a craft knife to help remove the tape. I bought a purple table from Ikea and super glued 4 large flat lego boards (the green ground) to it. My son has had the custom made lego table for 7 years, and it is still in good shape. Thanks for sharing your table redo.